* Performance may vary depending on SSD’s firmware version and system hardware & configuration. The sequential write performances are measured with Intelligent TurboWrite technology being activated. The sequential write performances may not be sustained for the portion of data exceeding over Intelligent TurboWrite buffer size. Sequential performance measurements are based on CrystalDiskMark v. 5.0.2. Random performance measurements are based on IOmeter1.1.0. * Test system configuration : Intel® Core i7-4790k [email protected], DDR3 1600MHz 8GB, OS-Windows 7 Ultimate 64bit, Chipset-ASUS-Z97-PRO. * The Intelligent TurboWrite technology adjusts the buffer size to optimal level within the usable disk space; up to 42 GB for 1 TB model and up to 78 GB for 2TB and 4 TB models. For more information on the Intelligent TurboWrite, please visit www.samsungssd.com. Always be sure. The 860 QVO is your reliable alternative to legacy storage, built with Samsung V-NAND technology, and backed by a limited warranty of 3-years or up to 1,440 TBW. 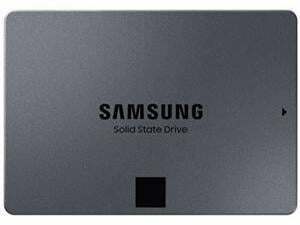 Samsung's extensive analysis of SSD user patterns resulted in a sufficient TBW rating to assure everyday PC users. * TBW : Terabytes Written. * Warrantied TBW : 360 TBW for 1TB model, 720 TBW for 2TB model, and 1,440 TBW for 4TB model. * 3-years or TBW, whichever comes first. For more information on warranty, please find the enclosed warranty statement in the package.